Whether your wedding is traditional or the furthest thing from it, there’s no doubt it reflects who you are. A bride and groom take great strides to ensure their wedding reflects their collective personality. 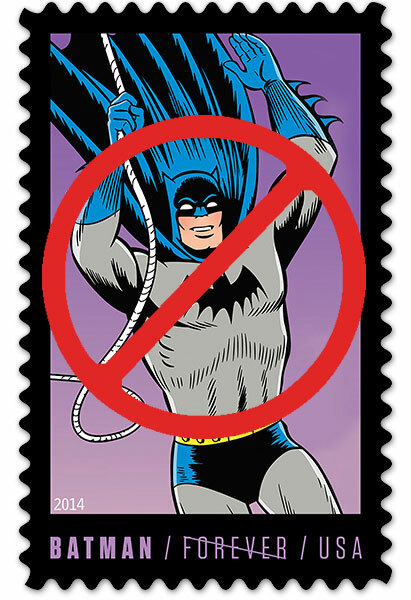 But in the past, couples would spend hundreds or even thousands of dollars on personalized wedding invitations only to have to put “flag” (or worst yet— “Batman”) stamps on their mailings. Such stamps would often clash in color or theme with their mail piece. Not any more. Now you can completely customize the look of your wedding mail with custom postage stamps from Minted. 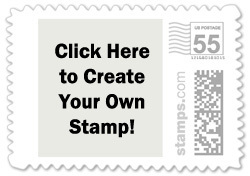 The USPS has authorized to let you create custom stamps for any occasion using photos, text, or whatever you’d like to put on a stamp. 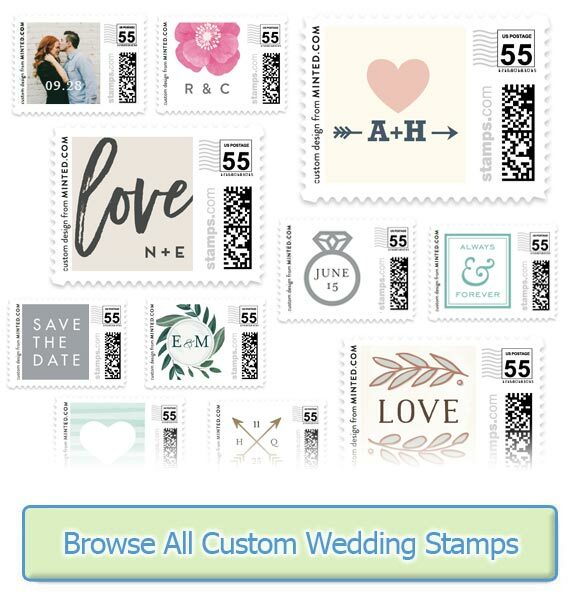 For a small premium (above the face value of the postage), these companies let you choose from thousands of wedding-themed postage stamps or create your own. Now you can control the look and feel of the stamps for your wedding mailings giving you complete control over the look of your invitations. Doesn’t the USPS Have Wedding-Themed Stamps? Yes, the USPS have a few choices for 1oz stamps ($0.55) at face-value. 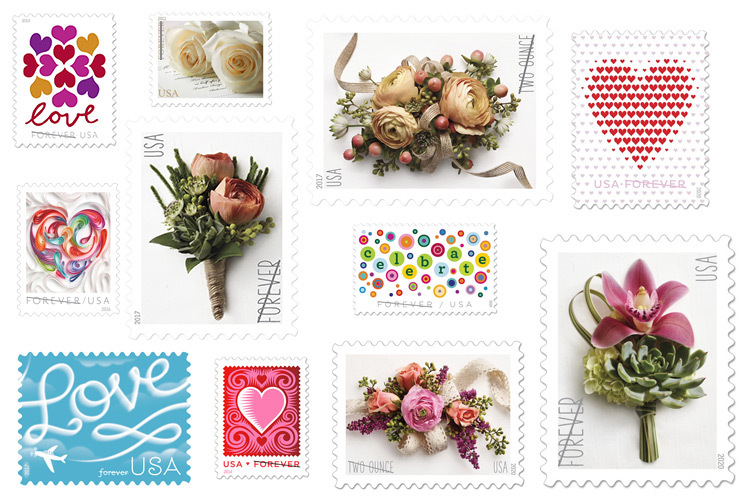 By contrast, Minted has over 2,000 wedding-themed postage stamps, plus you can create your own from scratch. To draw a simple comparison, imagine that there are three types of wedding bouquet flowers that are cheap: red, pink, and yellow carnations. Those will suffice, but you can pay a small premium, choosing from thousands of other types of flowers. Most brides pay the premium and choose flowers that correspond with their wedding. Like flowers, if you want stamps that reflect your wedding & personality, custom stamps are the way to go. Questions? 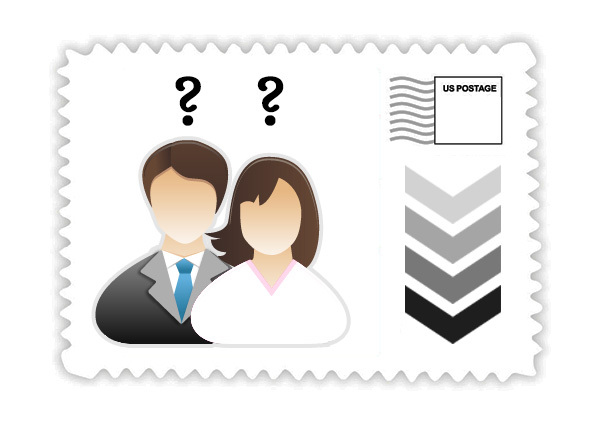 Read our Frequently Asked Questions about custom wedding stamps.